If you are missing a central and a lateral incisor or a canine ("eye" tooth) and a lateral incisor next to it, you can replace them with a single dental implant. 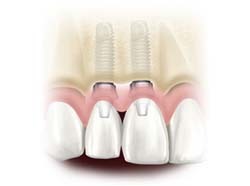 A dental implant restoration supported by a single dental implant will be esthetically superior to a restoration supported by two dental implants. If you are missing two front central teeth, then two dental implants will be necessary to support the missing teeth. If you have any questions about the types of services we provide that you would like answered before you visit, please feel free to contact us. The San Francisco Center for Periodontics and Dental Implants team looks forward to meeting you and putting you on the path to the perfect smile.